Spread betting is straight forward – but not as simple as ‘buy’ or ‘sell’. Here, we’ll look at the different types of order you can make. If you thought there was only one type of making a spread bet, you’re about to have your mind seriously changed! Market orders are the simplest type of order. With a market order, you’re saying that you’re happy to accept whatever the market’s prevailing price is. Let’s say you log onto your IG Index account and see that gold is 918/919. You’re selling, so you go short at 918. Then you ask for a quote on platinum and get 1755/1765. You say you’re buying, and go long at 1765. Both these straightforward transactions are market orders. A Market Order is thus an Order placed at the prevailing price for immediate execution. Market Orders are intended to be traded as soon as possible at any price prevalent on the market – use these only when you need to be filled immediately and you’re not concerned about the price you will be filled at. A Stop Order is an Order placed for execution once a certain price level is reached. A stop loss order works in the similar way to limit orders, but the other way around. We can say that we want to buy or sell at a less favourable price than currently. Hold on a minute – who’d want to wait around for a less favourable price? Well, remember stop losses? They’re the same thing as a stop order. You use them to automatically exit a trade when it’s moving against you. You can set a stop order for when a less favourable price is hit to exit a trade before an even worse price is reached! Stop Orders however can be placed to either get you into the market at a specific or more favourable price or to close down an existing position to limit any losses. Example 1: You have placed a trade to go Long DOW Futures at 8200 however the market is very volatile and you wish to limit your loss in the event the market falls. You place a Stop order @ 8000 so if the market falls to this level your bet is automatically closed for a 200-point loss. Example 2: The Dow Jones Index is currently within a trading range of 8300 and 8550 and is now trading at 8525. You place a Stop Order to Open a Short position when the market reaches 8490 in the hope that the market has commenced it’s move down to the bottom of the trading range. Markets move very quickly for a number of reasons, just because the market has moved down and your Stop Order has been executed do not be surprised if the market then retraces back to and beyond its previous levels. Each spreadbetting company has different rules as to how near the Market Price a Stop Order can be placed. This may vary from as near as a point beyond the spread (i.e. if DOW Futures are trading at 8200/8208 you could go Long at 8208 and place a Stop Order at 8199) to as much as 50 points (i.e. if DOW Futures are trading at 8200/8208 your Stop Order could be placed at 8150.) Please do check with your chosen company. Limit orders also can be placed to either get you into the market at a specific or more favourable price or to close down an existing position to lock in any gains. A limit order is thus when you make a trade, but ask for it to be executed at a more favourable price than you can get currently. Limit orders usually means you have to wait until the market moves and your price becomes available. Once it does, your trade happens. Example 1: Imagine shares in Anglo American are trading at 2758. You want to buy them, but you think that they’re overpriced. You can set a limit order to snap them up if they drop to 2600. Example 2: You have placed a trade to go Long DOW Futures at 8200 however the market is very volatile and you wish to lock in any gains in the event the market rises before falling back again. You place a Limit order @ 8400 so if the market rises to this level your bet is automatically closed for a 200-point gain. Example 3: The Dow Jones Index is currently within a trading range of 8300 and 8550 and is now trading at 8525. You place a Limit Order to Open a Short position when the market reaches 8550 in the hope that when the market reaches this level it will once again retrace to the to the bottom of the trading range. Markets move very quickly for a number of reasons, just because the market has moved up and your Limit Order has been executed do not be surprised if the market continues up and breaks out of the trading range. Futures are trading at 8200/8208 you could go Long at 8208 and place a Limit Order at 8217) to as much as 50 points (i.e. if DOW Futures are trading at 8200/8208 your Limit Order could be placed at 8250). Please do check with your chosen company. With this type, your orders won’t expire until you delete them. They’ll sit on the system indefinitely. Your bet will automatically be executed, if Anglo American ever hits 2600 or below. With this type of order, if the order isn’t triggered by the end of trading that day, it will expire. A controlled risk bet (sometimes referred to as guaranteed stop or limited risk) is exactly as described, in as much as you can determine exactly the level that you wish your bet to be closed out. Guaranteed stops as their name suggest guarantee your exit price even if the price gaps widely against you. There is typically a charge for this service and usually this is by way of an adjustment to the spread. An example of this would be that if you wanted to place a controlled risk bet Long bet on the DOW Jones Index Futures and the current Bid/Offer prices are say 8500/8508, then instead of Buying at 8508 you may have to Buy at say 8512 or 8515. Please check with your spreadbetting company exactly what methods they use for charging for CRB’s. Also determine how many points away from the current market price you are allowed to place your Stop. Some companies may be as low as 30 points but others may be high as 50. Guaranteed stops are well worth the additional cost especially in turbulent markets. In the event of massive volatility in the markets (e.g. Sept 11th 2001 or the Worldcom accountancy ‘scandal’ in the summer of 2002) your positions are protected. 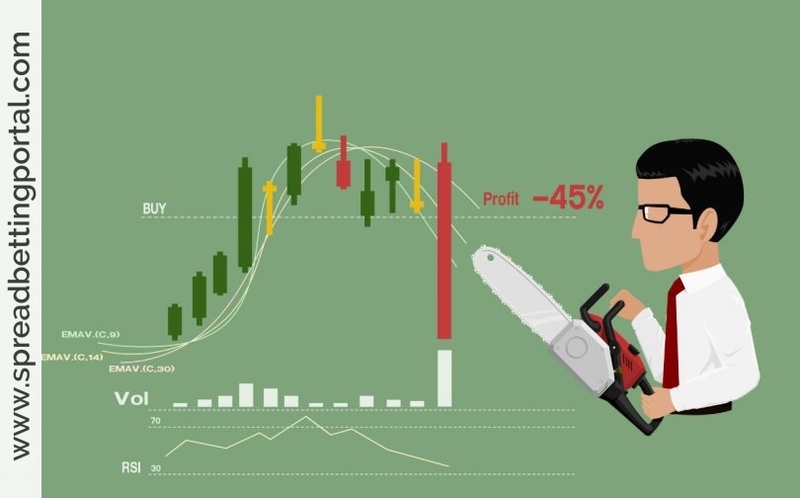 Some spreadbetting companies offer a limited risk only account – this is ideal for the newcomer to this fascinating way of trading the markets. Note that not all providers offer Guaranteed Stop-Loss Orders (GSLO). An OCO Order is an abbreviation for One Cancels the Other and combines the functions of both a Stop and Limit Order in one order process. With an OCO order (one cancels the other) there are two orders waiting in the trading system. But as soon as one is triggered, the other gets cancelled. Example 1: You have Long position Dow Futures at 8500 and you wish to Lock in gains if the market reaches 8600 or alternatively limit losses if the market reaches 8400 – the OCO order allows you to place both a Stop and Limit Order to Sell Dow futures at 8400 and 8600 and as soon as one Order is triggered then the other order is cancelled. Example 2: =An investor with limited funds might place an order to buy either Enterprise Inns or HBOS, depending on which first met the right criteria. He doesn’t want to end up buying both, so he uses an OCO. If Enterprise Inns enters his sights first, the HBOS order will be cancelled. All notes pertaining to Stop Orders and Limit Orders still apply to OCO Orders. These are the main type of orders you will use during trading, however new innovative order types continue to be developed and this section will be updated with news of any such techniques. A contingent order is an order that only gets executed if another order gets executed first. Let’s say we’re placing a stop order to go long on British Energy if it hits 700. At the same time as we’re entering that bet, we might also create a contingent order to abandon the bet and sell if British Energy subsequently nose dives. So our stop order would be ‘buy British Energy at 700′ and our contingent order would be ‘sell British Energy at 680’. Finally in this section, you need to be aware of two terms that you may see when placing Stop and Limited Orders. Most companies will ask you to specify either GFD or GTC when placing your order. The terms are quite straightforward inasmuch as the GTC order will remain until it is either triggered or is cancelled by you (however long the time period) and the GFD order will be cancelled automatically at the end of the trading day unless it is triggered or cancelled by you. Trailing stops allow a stop loss to be automatically moved to lock in profit when a bet goes our way. Imagine we open a market order LastMinute (LMC). The price is 500, and we decide we want to go long for £1 per point. At the same time, we decide that we want to run a trailing stop loss on our order. The first thing to do is decide on the initial stop loss. We decide to set it at 480 – about 20 points away. That means that if LMC drops, we’ll exit the bet at 480 – for a loss of £20. But the beauty of a trailing stop is that it can move with our bet. So if LMC climbs, our stop loss can climb with it. Trailing stops are a great facility, and are well worth using.